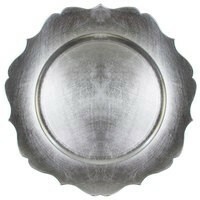 ChargeIt by Jay Scalloped Edge Silver Round Melamine Charger Plate 13"
Home > Products > ChargeIt by Jay Scalloped Edge Silver Round Melamine Charger Plate 13"
Create a stunning and elegant impression with the ChargeIt by Jay Scalloped Edge Silver Round Melamine Charger Plate 13". The attractive scalloped edge of this charger plate beautifully frames dinnerware while its lustrous silver finish adds classic elegance to any table setting. Made from premium quality melamine, this charger plate boasts a delicate look that belies its exceptional strength and durability. Thanks to its ample surface, this charger accommodates standard size plates and provides protection against spills and mess. This timeless-looking charger plate is not microwave safe and must be hand washed only.